"Six Nations Rejects 'Racist' Legislation"
Dearing, Stephanie, Tekawennake News (Ohsweken, Ontario: Tekawennake News, 1968), 24 Apr 2013, p.8 This article outlines the Six Nations Elected Band Council's opposition to the proposed Bill S-2, the Family Homes on Reserves and Matrimonial Interests or Rights legislation. "Bloc Quebecois Trying to Destroy Mohawks: Native"
Bryden, Joan, Southam News, Winter 1994 "Wounds from past constitutional wars were ripped open again Wednesday as a Mohawk leader accused the Bloc Quebecois of leading a crusade to discredit his people and deny them their sovereign rights." "While native activists have been protesting with blockades and challenges to government authority this summer, there's been a quiet revolution of a different kind on several Canadian Indian reserves." "Warrior Societies Break Great Law of Six Nations"
"Akwesasne Indian reserve and St. Regis are not the only native communities torn by disputes over sovereignty, cigarettes, bingo or gambling." "Mercredi Says PQ Offer is PR"
"A Parti Quebecois' promise to give natives royalties from natural resources is probably a "public relations gimmick," aimed at winning support for their sovereignty option, Ovide Mercredi said Wednesday." 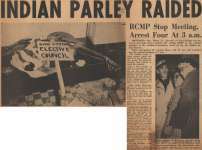 "Chiefs' Policy Claims Natives Have Right to Self-Government"
White, Vicki, Brantford Expositor, 4 Jun 1991 "After nine months, the province and the Chiefs of Ontario have produced a policy which could bring new life to the struggle for native rights." "Six Nations man faces jail time for notarizing Canadian documents"
"Elected Chief Wants to See Six Nations Move Forward"
Dearing, Stephanie, Tekawennake News (Ohsweken, Ontario: Tekawennake News, 1968), 8 May 2013, p.3 This article describes Chief William Montour's objections to federal omnibus legislation such as the Matrimonial Real Property law as attempts to alter the Indian Act. Further, Chief Montour discusses his view that Six Nations should work toward attaining sovereignty in the near future. "Aboriginal people want to replace the Indian Affairs Departmentwith a lean, new agency similar to a federal-provincial affairs office."